Nina Simone is a challenging figure. We get that from her music, but we also get it from her life. Early in her career she was described as “temperamental,” which is a nice thing we say about artists who yell at bandmates and fire managers and show up late for gigs. In Nina’s case, it was something far more serious. Her diagnosis varied over the years – bipolar disorder, multiple personality disorder, schizophrenia, borderline personality disorder – but it added up to a person who was angry, paranoid, and at times delusional. So, why a saint then? Because in the midst of all of that – because of all of that – she brought expression to a pain, sadness, and anger that her people felt in a time when everyone needed desperately to hear it. I am hesitant to romanticize mental illness among artists. We often think that we must be tortured and tormented by our own internal demons to make great art. This is, of course, not true; there are plenty of happy artists. However, there is something powerful about wrestling with our demons that can propel us to see the demons in the world more clearly and give expression to that struggle in a way that allows others to see them, too. That is what Nina did. At the same time, her burgeoning musical talent was bringing her some attention. She started playing when she was two-and-a-half. By the time she was four, she was accompanying her mother in churches all over the area. On Sundays, she played from eight in the morning until midnight and again on Wednesdays and on occasion at the Assemblies of God church in town. She did this every week until her early teens. At some point, Eunice started taking formal lessons under the tutelage of Miz Mazzy, Muriel Mazzanovich, with the patronage of Mrs. Miller, who employed Kate as a housekeeper. Music was simultaneously a joy and a burden for Eunice. It came so naturally to her that it was a bit of freedom. Playing at the church taught her how to move an audience with her music, so it was empowering. It brought her notoriety in town, but not connection. She practiced and played so much that she had little time for friendships. In her own house, her talent and even her hard work was viewed as a gift from God and thus not a cause for pride. She was never praised, only given more expectations. With hard work and humility, she was told, she would be the first black classical concert pianist. Miz Mazzy was different. She gave Eunice the maternal nurturing that Kate’s schedule, temperament, and theology would not allow. Miz Mazzy was proud of Eunice. The Waymon family also took race relations in stride, chalking up to some expression of divine will. Tryon was integrated in a way that many Southern towns were integrated. Black and white families lived and often worked side by side, but their personal lives were separated. There was a caste, with blacks always serving whites. Whites could patronize black businesses, but not the reverse. Everyone was friendly and no one complained. The Waymon family in particular did not complain. They were considered by whites and blacks alike to be “a cut above.” They were more financially successful than most. J.D. and Kate both worked hard. All the kids were well behaved and did well in school. As my grandmother would have said, they were some of the good ones. Early in Eunice’s life, this peaceful coexistence was a comfort, but eventually she noticed what this system meant for her as a black girl. So, in 1963, when her good friend Lorraine Hansberry, the author of A Raisin in the Sun, asked her to stand up and participate in the civil rights movement, she was not sure it was for her. That quickly changed with the death of Medgar Evers and the church bombing in Birmingham. When she heard the news of the bombing, she ran to her garage, looking for a weapon. Her husband, Andy, reminder her that she knew nothing about killing and said, “The only thing you’ve got is music.” She sat down and wrote “Mississippi Goddam” in about an hour. This would become her signature song and her first miracle. For her, that was it; she was done with the polite race politics of her upbringing. The death of Medgar Evers was the spark that would fuel her artistic output for the next ten years. She sang of her experience as a black person, as a black woman. It was often filled with pain and anger, but also an ebullient hope. She was devoted to the purpose of lifting up black people. At the same time, she was being brought low by her deteriorating mental health. Not only does an untreated condition accelerate over time, but her life was very stressful. The life of a performer is often in direct conflict with self care. Travel and performance schedules left little time for real rest. Always being in the limelight. The livelihoods of your entourage are on your shoulders. But more than that, I wonder how much her work on race compounded everything. When she wrote and performed these songs, she was diving deep into an abyss. We now know about black PTSD. Much of the experience of people of color is deciding which battles to fight, when to let it go and when to push back. So part of the coping skill is deciding it is not worth your time and energy, deciding to give yourself a break even if it means giving your oppressors a break, too. But between 1964 and 1974, it doesn’t seem Nina ever let anything go. Every performance was a celebration of blackness and a referendum on whiteness. Even songs that were traditionally love songs or ballads were tinged with struggle, love lost to racial violence rather than typical romantic tragedy. As one reviewer noted, she “let the whites present know unmistakably where things stand.” For her, there was no rest from the fight. By 1974, the struggle for racial justice had devoured her. She was divorced for the second time and estranged from her daughter. Her performance opportunities had dried up due to her erratic behavior. The music world had moved on from her style of music. But she also had given up hope for the Civil Rights Movement. In her mind, all her work had only led to compromises that ultimately left black people in the same circumstance. She became antagonistic to other black leaders and largely wrote off the possibility that America could heal itself. She lived in Europe for the most part for the last thirty years of her life. She played and recorded on occasion. Every now and then she would mount a comeback with new management and a new band, but these attempts were always short-lived, always one outburst no-show away from collapse. The hope was gone and all that remained was anger and pride, just as her mother had warned. 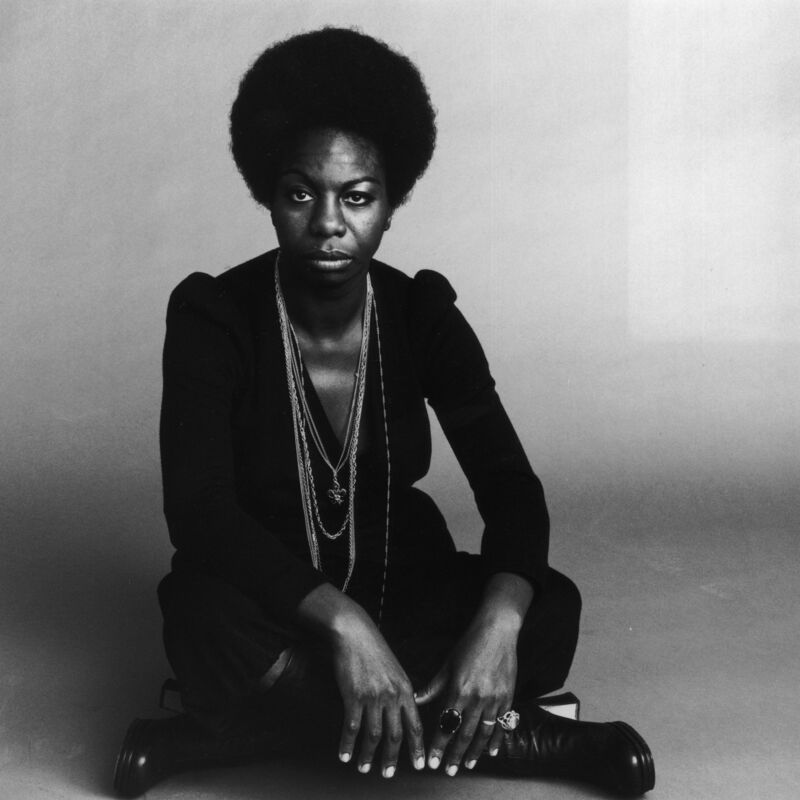 Nina Simone burned herself out to give the world the most profound beauty. She had some challenges, but she dove into them and transformed them into challenges for us. Many saints become saints because they are martyrs. Nina Simone is a martyr. She sacrificed herself – her material well being, her relationships, her sanity – to lift up her people. She said that all she wanted was to be free, but she never really was. She sacrificed her freedom to try to gain freedom for others, no matter the cost. In the name of St. Nina, we pray that we will take up her challenges and continue the fight where she could not.